UCSC and the Santa Cruz community are welcoming students, faculty, and staff to a new academic year with hundreds of posters, like the one at right, in local businesses and campus locations. Move-in weekend began on Thursday, September 14, and classes are scheduled to begin Wednesday, September 20. 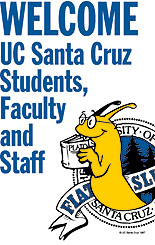 For more facts about UCSC's student body, campus efforts to house students, and new academic offerings, read on (more).